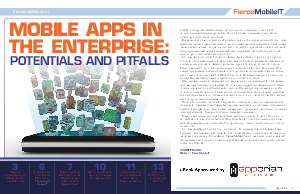 With more mobile workers using personal smartphones and tablets to conduct business, 2011 is being heralded as the year of mobile apps in the enterprise. Today's corporate IT departments are faced with a multitude of questions: Should they develop apps internally or outsource? Is it better to deploy pre-packaged apps or build from scratch? Still, the benefits of mobile apps initiatives will far outweigh the challenges of getting them into the enterprise, in the form of increased work productivity and customer response, analysts say.